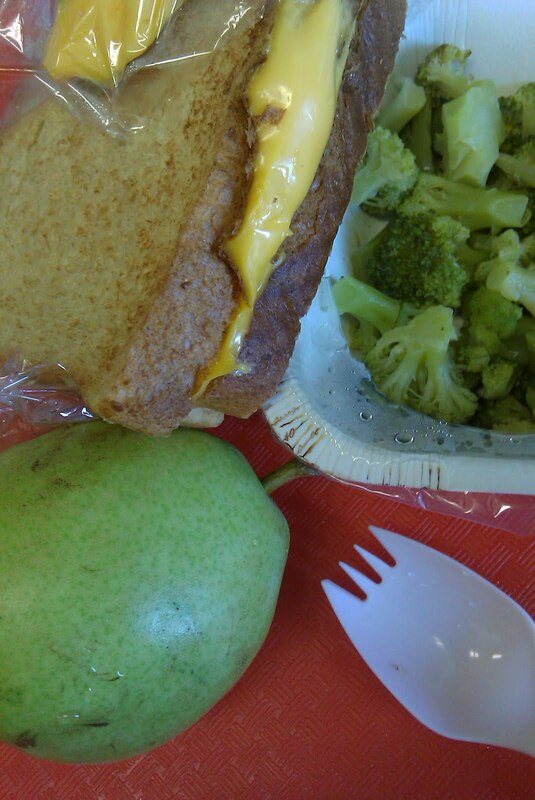 I had another flashback to one of my favorite school lunches as a kid: the grilled cheese sandwich. There really was nothing better and at my old school it was always paired with tomato soup. I still like making that combo for my family at home. But today’s sandwich was actually not like what I remembered from my school days. It was just a cheese sandwich. I think that “grilling” has been downsized. You know, I think that the meals are changing just slightly by offering more fresh fruit and new veggies. Compare to this meal from January. Are the people in power reading my blog? The sandwich doesn't look very appetizing, but that's probably because it was smushed into it's plastic wrapper. Still, it's really good to see improvement. 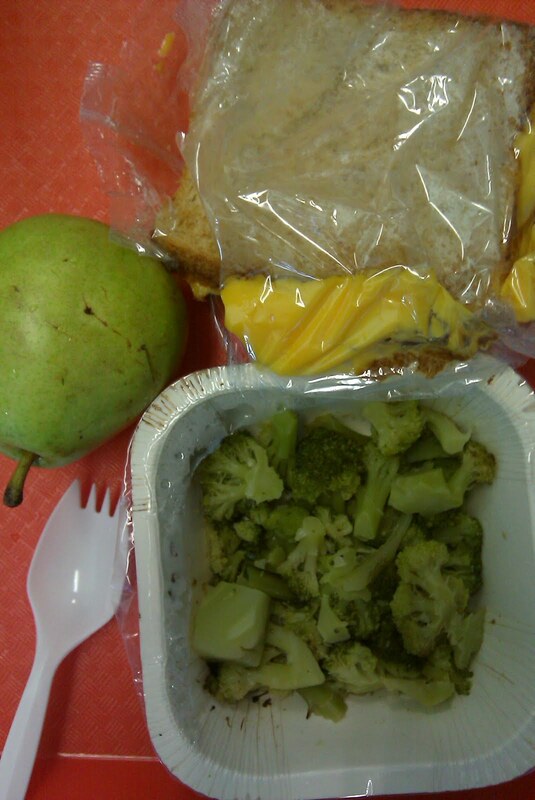 I would definitely eat the broccoli and the pear. So it was more of a steamed cheese sandwhich? aww c'mon. really? this looks horrible. you have talked about price before, and i remember paying more than what you talk about. our lunches were 4.50 and up, i know that i would be upset if this is what my choice was.viva le brown bag. i also rememebr never, ever being able to stomache anything that had cheese on it in school. This lunch actually seems semi-normal (more fresh and balanced). It is good to see real fruit and vegetables. The cheese looks kind of gross though – congealed and plastic. I think they would have been better off without trying to heat the sandwich. Thanks again for doing this project. It is bring much needed awareness to the plight of school nutrition. I remember grilled cheese and tomato soup in the cafeteria in the 60's. Classic stuff. The sandwich was good. This sandwich doesn't look "semi-normal" to me – it looks grotesque. Hermetically sealed. I mean really, you can't stick two pieces of bread and a couple of pieces of cheese together with some butter or margarine and toast it up? No salmonella risk or E-Coli risk, just toast and serve. how strange that it was just a plain cheese sandwich. That doesn't seem healthy at all. Although I do love grilled cheese, and I guess that isn't any healthier. Perhaps they think a 'raw' sandwich is better because there isn't the butter used in grilling? Hmmm. Other than the pear, this doesn't look appealing. Are you watching Jamie Oliver's show? I think it will be very interesting! Come on Mrs. Q — no description or comment on the "cheese"? Could you bring yourself to taste it? If I ran the world I would force your principal, all your school board members and the president to the Food Service company provider to sit down and eat that sandwich. Bleck! I wonder if there are more fruits and veggies available because of the season? I know we aren't in the full swing of warm weather yet, but produce overall has been cheaper at the local grocery store lately. I'm glad to see you have not had another peanut butter and jelly graham cracker thing. I remember we had peanut butter and jelly pockets when I was in elementary school. It was like a Hot Pocket, but cold and filled with a peanut butter and jelly blend. Disgusting. I love what you're doing. I'll certainly continue following! Watching Jamie Oliver's Food Revolution tonight. Loving it! He's doing the same thing to school lunch that you're doing! Keep it up! Great work! You mentioned you think the offerings of fresh food is going up and wondered if they are following your blog…I have noticed that this month the menu that came home from my child's elem school is getting better. (NW Chicagoland school) Fish is actually on the menu this time (although it's fish nuggets, I think that's better than a hot dog) and pizza variations have been relegated to 1-2 times a week instead of 3 times a week. It's not just this blog…there is so much publicity over nutrition right now that I think everyone is becoming aware and making small steps forward. I'm really glad Mrs. Obama is promoting good nutrition, that helps. It's been interesting as well to hear the debates on the news from students with the school board in Chicago Public School system trying to improve the meals since the contract is up for renegotiation. I'm really glad Michael is keeping us updated with the news stories in this area, and I've really enjoyed the guest posts (as well as thinking it must be taking some of the burden off you to let others help). Keep up the awesome work! Yuck. The sandwich looks disgusting. I LOVE grilled cheeses, but that just looks inedible. The veggies look good though! The only thing that looks safe to eat is that pear! I carried a LOT of cold sandwiches when I brown bagged lunch in school, and I've got to say, cheese singles NEVER hold up well once they're unwrapped and slapped on a sandwich. I don't know if it's because they're actually made with as much oil as milk half the time or what, but they'd end up slimy every single time. I finally just stopped adding cheese to my sandwich once I started making them for myself. Yay for fruit and veggies though! I think that show "foood revolution" may be helping the schools with this. People are talking about it. Parents are watching. People are starting to think about home schooling. That means less money for schools. So, they have to do something, right? Plus Michelle Obama is going on the warpath about this, too. Hopefully we have an ally in our corner. Okay, that is one heinous-looking sandwich. I'd rather go hungry. The pear looks really good, though. Individual schools should be free to set their own rules — and I reserve the right not to place my child anywhere that refuses to allow him to cut up his own steak! Are you tracking any of your weight gain and/or loss during this adventure. Either way you are still eating garbage. I feel sorry for the kids that don't have a choice. As I follow your blog, and see the interviews on ABC News, I have keen interest in this epidemic of poor quality food for the masses. When you look at the amount of money spent in wrapping these food items and the waste going into the landfills, I have to question who's getting paid to make these decisions? I suspect there have been studies performed on how many chemicals the kids are eating from the wrappers being warmed and food sitting in these. Does anyone know specifics of this? I suspect you're getting more fruits and veggies at the end of the month due to excess dollars and food distributers having more access to produce from the south. I am curious about your weight also? I had sandwiches like that as a kid. They look worse than they taste. I mean, they're not the tastiest "grilled" cheeses in the world, but they're serviceable. Very processed-tasting, though. In lieu of tomato soup, I usually dunked mine in a little ketchup. It's official. I've read your whole blog now! And I watched Food Revolution. While watching Jaime Oliver make chicken nuggets, my daughter, who just turned 6, kinda "fell" for JO's goal — gross them out by what's in a nugget and they'll stop eating it. She's now thoroughly grossed out! LOL I explained to her that this (what was on the show) is a good reason why I limit her school lunches to maybe 1 a week. We don't make a lot of money; in fact, we qualify for free breakfast & lunch. I would just rather live more inexpensively in other areas so that we can afford for her to eat at home and pack lunch most days. I understand not everyone can do that; we are grateful for the choice. I'm glad you're blogging and Jaime Oliver is filming and Michelle Obama is speaking b/c this force the 3 of you, along with I'm sure many others, have created is what this country needs for the children who don't have a choice. I lived in Northern Illinois when I was younger (k-2) and our lunches were scratch every day? what has happened? this is nuts! maybe you should give Jamie Oliver a call to come to your school! If I were a kid, I don't think I'd want to eat that broccoli. As an adult, I like plain broccoli with a little salt, but I didn't as a kid, and I would probably have skipped it. Just serving unappetizing veggies is not going to make our kids healthier –they're just going to throw it away. That is the grossest cheese sandwich I have ever seen. Am I the only one who worries that the plastic wrap somehow melded with the cheese in the steaming process? How did they manage to mess up a grilled cheese sandwich?? Mr. Mom was even able to pull one off with an iron and ironing board. Aside from the cheese melding to the plastic…(mayfieldflowernn, that was the first thing that crossed my mind, too), how does one even get the cheese all over the place like that? My guess….1)add two slices of processed cheese flavored food to two slices of toast the day before serving; 2) throw in baggie; 3) throw in fridge; 4) throw everything in food warmer the following day; 5) remove from warmer until cheese and plastic begin to get oozy and meld 6) serve to children and Mrs.Q. A friend of mine actually works in a school cafeteria. Sometimes she'll bring leftovers to our house because there's too much to go around. Some has been okay but she recently brought over Macaroni and Cheese. It was soggy and had a very disgusting aftertaste. I'm so glad that somebody's trying to make a point about the grossness of school lunch. We had "grilled cheese sandwiches" for lunch yesterday, and they were NOT grilled cheese. It wasn't grilled and I'm 110% sure it wasn't cheese. Bllleeeugh. And our school does offer pears and apples, but nobody ever gets them because they're so hard and unripe that you can't even bite into them, no matter how hard you try. Sometimes the main lunch choice is so gross that I just go into the pizza line and grab a slice of pizza instead, but I always peel off all of the "cheese" and soak up the grease with a napkin before I eat it. I'm gagging just thinking about it. Could the increase in fresh fruit have to do with the seasonality/prices of fresh fruit? I, personally, buy a lot more fruit now than I do through the winter. I have been following your blog from the second week. Suddenly a revelation: The problem is not only the individual food items but the way they are put together. I cannot image serving a cheese sandwich and a ?steamed broccoli as a combination at home. Cheese sandwiches go well with soup. Most of your lunch postings have to me a "don't go together" feeling. I know this is a cultural bias, but most of the combination you have eaten just don't go together well, imo. William's got a good point. If I were making a cheese sandwich for lunch at home and wanted a vegetable side, I'd have carrot sticks or celery or cucumber slices, not steamed broccoli. Same with the French toast pizza and fruit cup from a few days ago – pizza goes with salad, not fruit cup. Ew, that sandwich looks terrible, as do the vegetables. They are WAY over cooked…it's broccoli carcass. The only thing that looks good is the fruit. I can't get over how every meal is one solid color. It's either all yellow or all orange or, in this case mostly green. Color overload, I'd refuse to eat 2 green things in one meal too! I wonder how many children eat the whole fruit? I am a lunch lady and I have to say that our lunches look and probably taste so much better than what your school servers. The cheese sandwich you have pictured is gross looking. I can at least say we toast our sandwiches and server with tomato soup that is the same as what Eat-n-Park would server. We have fresh pizza everyday in more than one variety, wraps and sandwiches that are hot and fresh. We do have frys, and stuff that is precooked that we have to heat up. But nothing in a microwave container that is the like a tv dinner. yuck. Oh we have a great salad bar that has fresh fruit and vegetables on it as well. Serving good appealing lunches is possible. But we do have the challange of using what the goverment sends us, and keep to the state standards of how much to use of each product. I don't know if it's just the pictures, but that cheese sandwich looks…unappetizing. Looks like those cheese slices, or what I think is called American cheese? Ick. I like a good cheese sandwich, but it needs to have real cheddar in it!